My favorite candy bar as a kid was the Almond Joy bar—sweet, sticky coconut topped with almonds and enrobed in milk chocolate. I haven’t had one in years, but I’d probably still love it today. Years ago a pastry chef named David DiFrancesco sent me a recipe for a cake which, in my mind, combined the best flavors of those two classic candy bars. It’s a Chocolate Almond-Coconut Cake, and it continues to be one of my most requested recipes (even though it’s not my recipe at all). The recipe features a cake made with lots of almond paste, cocoa powder and very little flour, so it’s moist with an intense chocolate almond flavor. After it’s baked, the cake is topped with a sticky coconut layer, and then the whole thing is covered with a dark and shiny chocolate glaze. It’s chocolate, it’s almond and it’s coconut. And it’s really good. 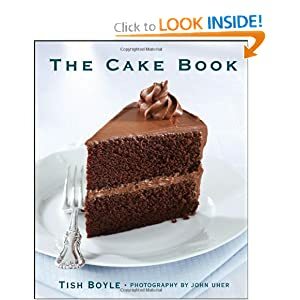 Order Tish Boyle's "The Cake Book" - Tish Boyle, the award-winning author and editor of Chocolatier and Pastry Art & Design magazines, unlocks the secrets to baking great cakes, with nearly 200 irresistible recipes and practical guidance on ingredients, equipment, and techniques. 1. Position a rack in the center of the oven and preheat the oven to 350°F. Grease the bottom and sides of a 9-inch springform pan. Line the bottom of the pan with a round of parchment paper and grease the paper. 2. In a medium bowl, sift together the flour and cocoa powder. Whisk to combine and set aside. 3. Break the almond paste into 1-inch chunks and place it in the bowl of an electric mixer along with the sugar and one of the eggs. Using the paddle attachment, beat the mixture on low speed until smooth, about 1 minute. Add the softened butter and beat on medium speed until light, about 3 minutes. Add the remaining 3 whole eggs, one at a time, beating well after each addition and scraping down the sides of the bowl as necessary. Beat in the egg yolk. Add the cocoa mixture at low speed, mixing just until blended. Remove the bowl from the mixer stand and mix it a few times with a rubber spatula to ensure that the mixture is evenly blended. Scrape the batter into the prepared pan and smooth it into an even layer. 4. Bake the cake for 40 to 50 minutes, until the top is firm and a toothpick inserted into the center comes out with a few moist crumbs clinging to it. Cool the cake in the pan on a wire rack for 20 minutes (the cake will fall in the center as it cools). 5. Remove the side of the springform pan. Place a 9-inch cardboard cake round on top of the cake and invert it. Remove the bottom of the pan and the parchment paper from the cake (the bottom of the cake should now be the top). Cool the cake completely on a wire rack. 6. Place the coconut in the bowl of a food processor and pulse until finely chopped. Add the corn syrup and pulse until the coconut is evenly moistened. Spread the mixture over the top of the cake in an even layer. 7. Place the chocolate in a medium bowl. Combine the cream and corn syrup in a small saucepan and bring to a boil. Pour over the chocolate and stir until the chocolate is completely melted and the glaze is shiny. Set the cake on the wire rack over a sheet of parchment paper or silicone mat. Pour the warm glaze over the top of the cake and use a small, offset metal spatula to smooth it evenly over the top and sides. Refrigerate the cake until the glaze is set, about 20 minutes. Scrape up any extra glaze from the paper and transfer it to a small bowl. Cover and refrigerate for about 20 minutes, until firm enough to pipe. Transfer the cake to a serving platter. Pipe the chilled glaze in rosettes on top of the cake. 8. Cut the cake into wedges and serve with whipped cream.